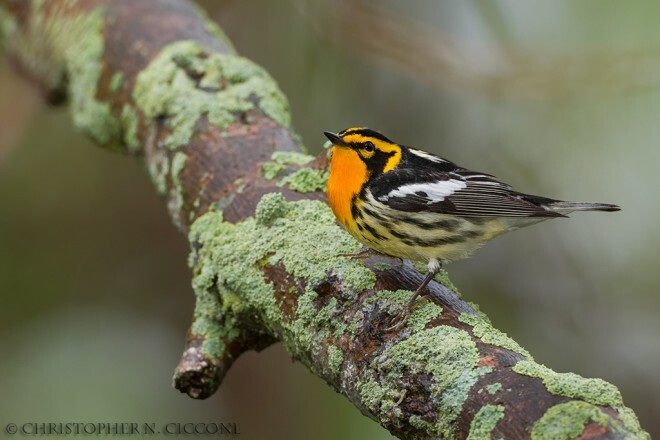 Blackburnian Warbler, Magee Marsh, Ohio, by Christopher Ciccone. A scrap of color against the gray sidewalk caught my eye, and I stopped. Here, in a bleak cityscape of concrete and glass, was something vividly alive: On a small planter by a building was a tiny bird. 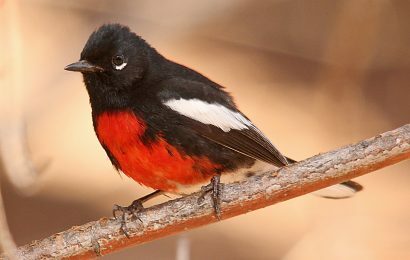 Its plumage patterned in black and white and orange, its eyes bright, it glowed with the intensity of life. The voice was right behind me, and I glanced back. Two businesswomen. Smart-looking suits, briefcases. Maybe the question was rhetorical, but I answered anyway: It’s a Blackburnian Warbler. Their expressions told me that this was really no answer. I tried again. This bird, I told them, belongs to a group called warblers, and this is the season when warblers are migrating south. There are dozens of warblers. This one’s called a Blackburnian. Probably came from somewhere in Canada, on its way to South America. I expected them to walk on — people in this city take pride in being unimpressed by anything — but they were still looking, and now a young couple stopped also. Suddenly it seemed important to connect, to help these people appreciate the bird. Fumbling through my day pack, I pulled out my field guide: Look, here it is: Blackburnian Warbler. Red on the map is where it lives in summer. Gray is where it passes in migration. Blue would be winter range, but that’s off the map. 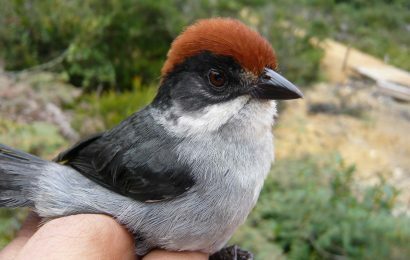 This tiny bird travels from spruce forests of Canada to high jungle of the Andes round-trip every year. It rests by day and flies by night, navigating by the stars. It is amazing, in a way. 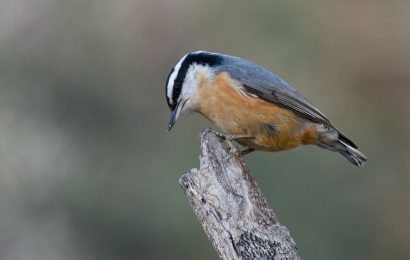 Amazing, a miracle that this bird even exists. But it’s no surprise that it’s here. Look down the street there, that patch of green; Blackburnian Warblers stop over in that park every spring and fall. So do a lot of these others, see, these warblers on the other pages. Untold numbers of these tiny birds are flying over the city most nights in spring and fall, a massive river of birds, unsuspected by most of us. Just as the humans here on the sidewalks are hurrying to work and appointments, the birds have appointments with the seasons. They have followed these rhythms since long before the city existed. The people were actually looking at the field guide now, and I reflected that at one time I would not have bothered to share. Wrapped up in advanced-birding pursuits, I would have studied the bird in detail and ignored the passers-by. But not any more. 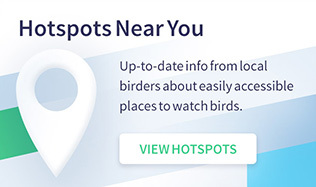 I had finally realized that bird populations face major threats. 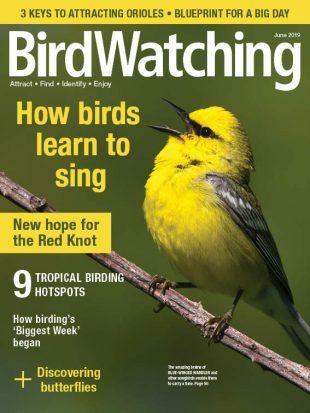 A warbler like this Blackburnian might be powerful enough to vault continents, but it was also fragile enough to be stopped dead by a window; and its whole race could vanish if no one cared enough to save the habitat that it required. Birds, I now realized, needed all the friends they could get. I had enjoyed studying expert-level detail, but now it seemed more important to share, to try to open more eyes to the wonders of birdlife. Soon the people would walk away … Look, I said, please take these. These bird magazines — they’re extra copies. Please take one and read it. 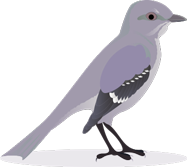 Read about the birds around you, things you’ve never imagined. Then visit that park some morning. See what birds are there. You’ll discover a whole new world. At that moment the warbler shook itself and flew. We all followed it with our eyes as it flew lightly and swiftly down the street, heading for the green haven of the park and the larger world beyond. 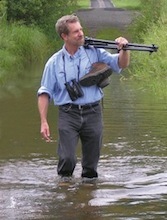 Kenn Kaufman is a longtime contributor to Birder’s World. 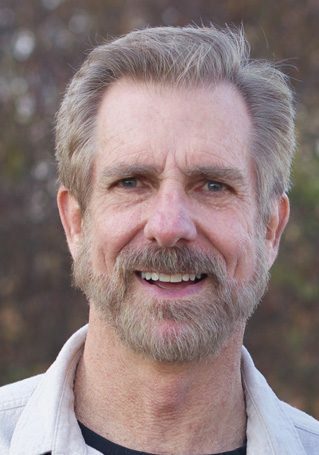 His work first appeared in the April 1988 issue.